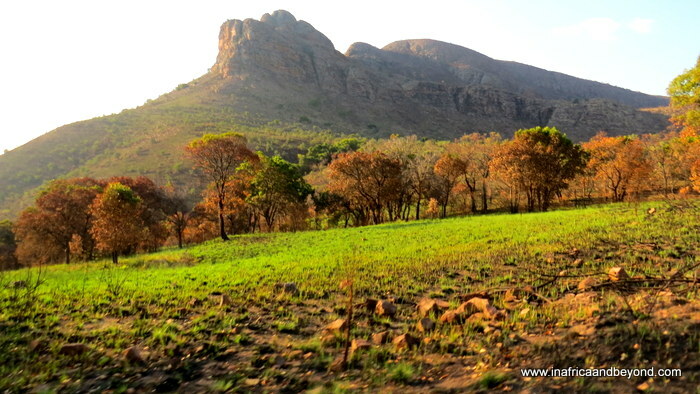 In between visiting Morukuru Owner’s Family House in the North-West Province and Mhondoro Game Lodge in Limpopo, we spent two nights in the iron-mining town of Thabazimbi, which was approximately halfway between the two. 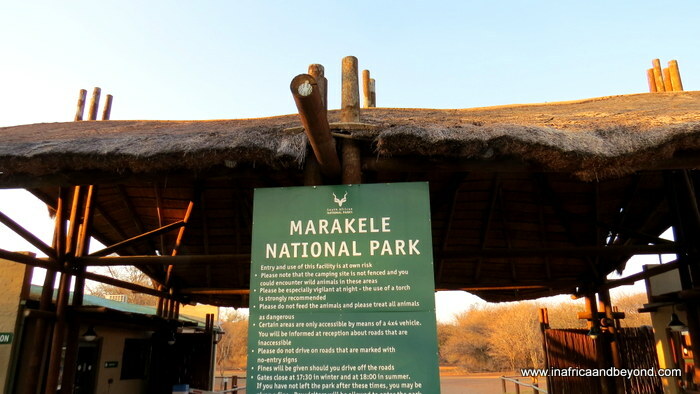 Marakele National Park was just 15 km away from Thabazimbi, and of course, I had to go there, especially since I had never been there before. We had a slow start to the morning and only got there about 11:30 am, not exactly the ideal time for game viewing. It was a hot day too. Before paying the entrance fees at reception, we asked the staff members about the road conditions. They said that it was suitable for a sedan -which we were driving – so we proceeded to pay the fees, which were R44 for adults and R22 for kids under 12. 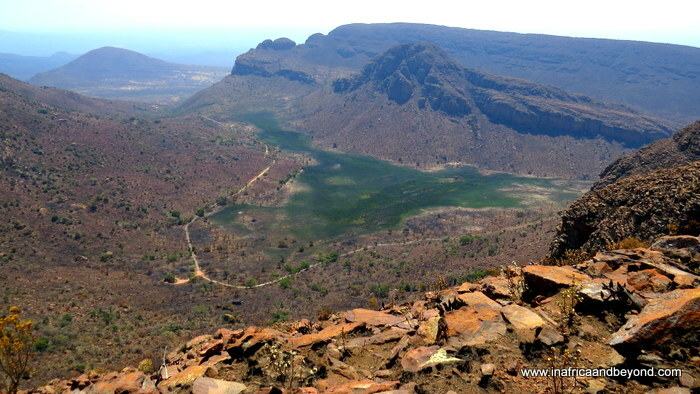 Marakele National Park is divided into two sections – a normal game section and a wild Big Five section. 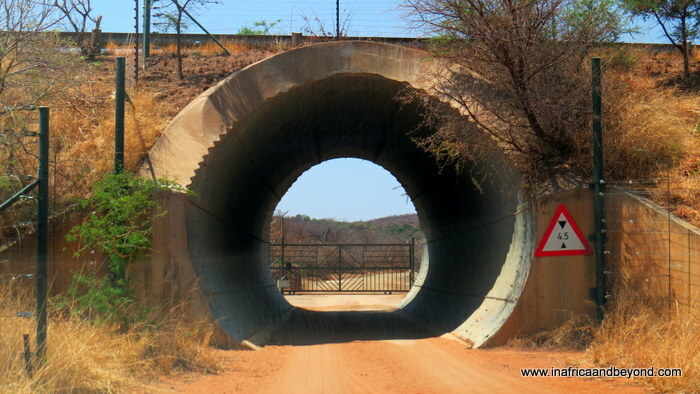 The latter is fenced off and accessed via an electronic gate after passing through a tunnel. 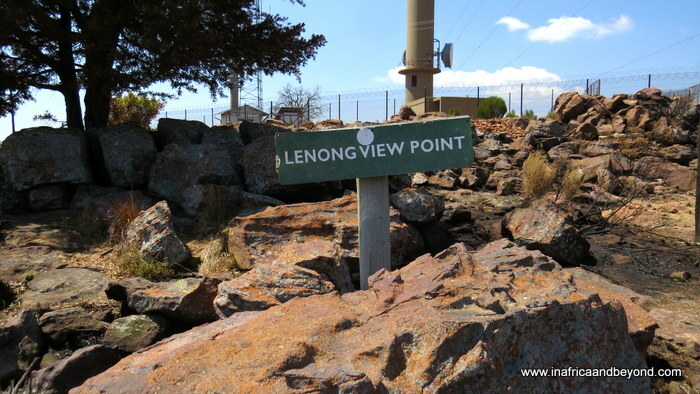 We kept to the single sedan trail and drove towards the Lenong View Point, the highest point in the park. The first part of the park consisted mainly of burnt grassland. 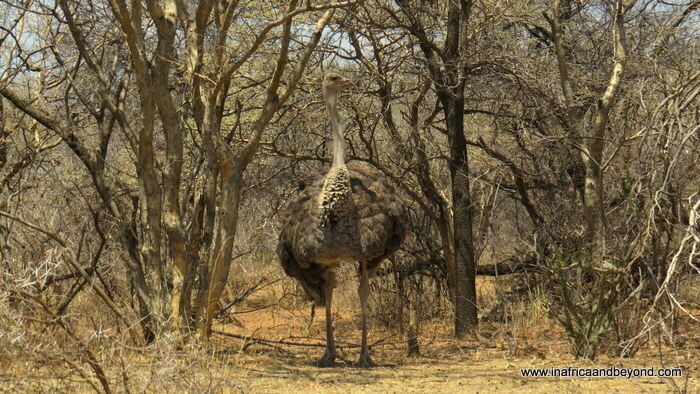 We spotted a female ostrich camouflaged by the dry trees but not much else. 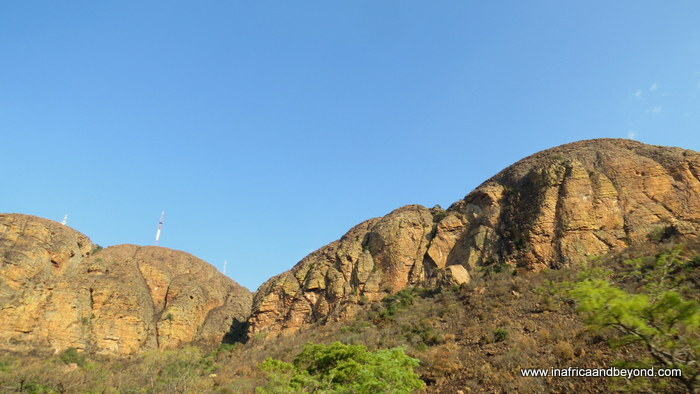 Then we crossed over to the Big Five section and the terrain began changing. It became greener as we went further in. Most of the park is dominated by the Kransberg Mountain Range and towards the end of the park there was a fertile green valley. 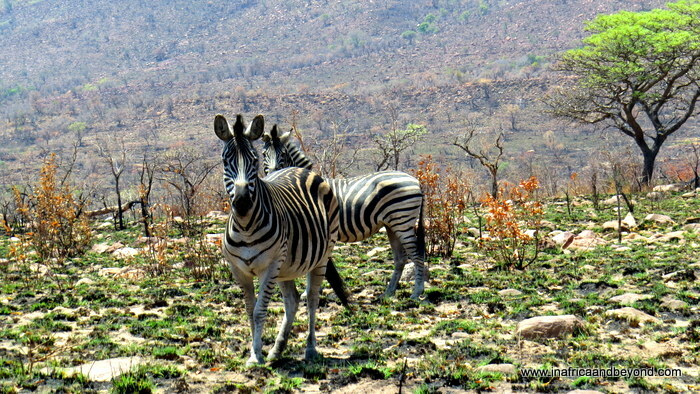 We saw some antelopes, zebras and wildebeest there. Much to our chagrin, we discovered that most of the roads were quite bad and not really suitable for a sedan. We embarked onto a long steep road, leading to the Lenong View Point. The road wove around a mountain and was wide enough for one car only. I kept wondering what would happen if another car had to come speeding in the other direction. It was an accident waiting to happen and there was no turning back as a U-turn was impossible. 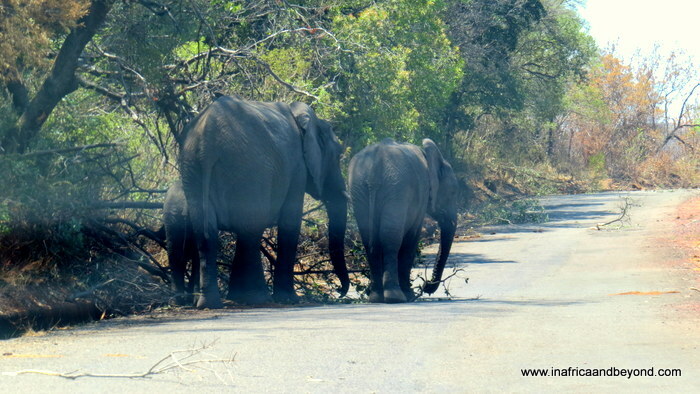 At one point, some elephants were feasting on trees on the road ahead of us. We had to wait a while for them to leave the road. They didn’t go far though. As we drove past the area where they had been eating, a huge bull shook his head at us and trumpeted loudly. We drove past as fast as the road allowed us to. 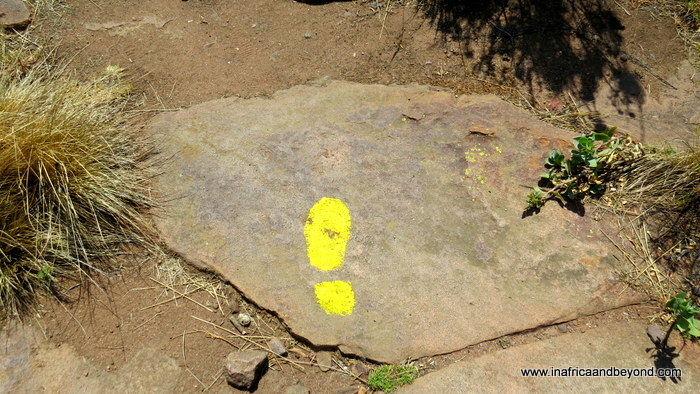 We finally got to the top, jumped off the car and followed the painted yellow footsteps on the ground, down to the viewpoint, where we had beautiful views of the mountains and the green valleys. The air was much cooler here than down below. It felt peaceful and serene. Marakele National Park is home to the world’s largest colony of breeding pairs of Cape vultures in the world – approximately 800 of them. This was the best part of the park to see them and we watched them gliding and soaring overhead as we sat there enjoying the picturesque surroundings. We called our insurance company. They said that a normal tow vehicle wouldn’t be able to come up the mountain to fetch us. They needed a specialised vehicle, which could only come the following morning. We called the park staff. They said that they would see what they could do. We spent the next three hours brainstorming, and making lots of phone calls. We could see baboons in the distance, and heard something akin to a lion’s roar far away. 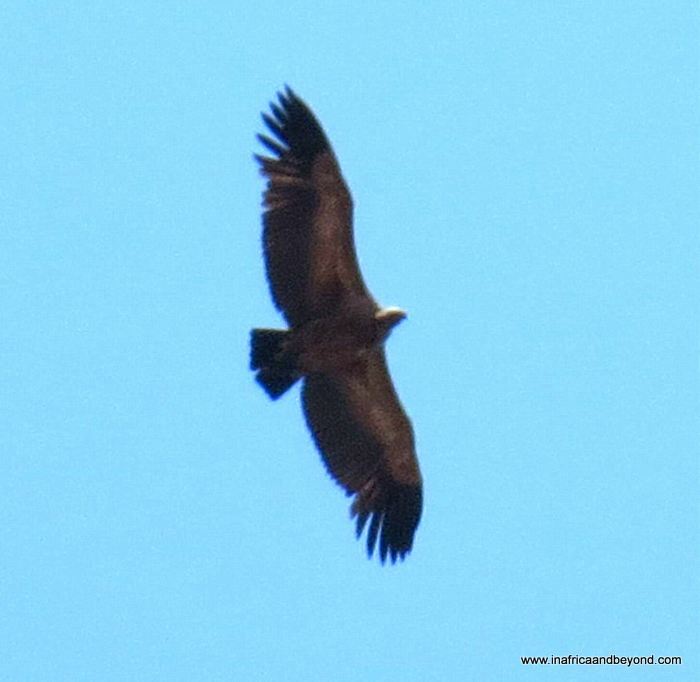 The Cape Vultures continued to fly overhead. At 16h00 and my husband and I were beginning to worry about whether we would have to spend the night on the mountain. Apart from the fact that it wouldn’t be too comfortable to sleep in the car, we were in an unfenced Big Five area. The kids weren’t too bothered though and were more interested in running around on the mountain. We called the park office again. At around 16h30, two park rangers came to pick us up with an open bakkie (van). They told us that they had to rescue people whose cars got stuck in the park every other day (proof of the bad roads perhaps?). We took all our essentials with us, left our car behind and hopped onto the back of the bakkie. We sat next to freshly cut impala horns and sped off down the mountain. The rangers asked us how we were going to get back to our hotel. We said that we were planning to call a taxi. Laughing, they replied that there were no taxis in the area and kindly offered to take us to our hotel in Thabazimbi. We offered to pay them, which they accepted. Thus, we left Marakele National Park, which ironically means “Place of Sanctuary”. Back at our hotel, we discovered that there were no taxis, Uber or car rental companies in Thabazimbi. We began making frantic phone calls to find transport for the following day. Offices were closing and at the end of the business day, we still had no clue as to how we would be travelling the following day. By the time we decided to have dinner, the hotel restaurant was closed. There was no Mr Delivery and no restaurants within walking distance. That night we dined on the chips, nuts and biscuits that we had been carrying as snacks. The next morning, after several phone calls, Europcar sent a car for us from their Lephalale branch. They did charge us an arm and a leg for it though. Our car was taken down the mountain and towed to our mechanic in Johannesburg, which also cost a considerable amount. Once we were in Johannesburg, we returned the rental car at OR Tambo International and retrieved our spare car. We’ve also decided that it’s time we got an SUV, so we’re test-driving SUV’s at the moment. When we tell people about our adventure, the first question they ask is whether the kids were scared. Fortunately, my kids handled it in their stride without complaining much. I guess they trust mum and dad to make a plan. 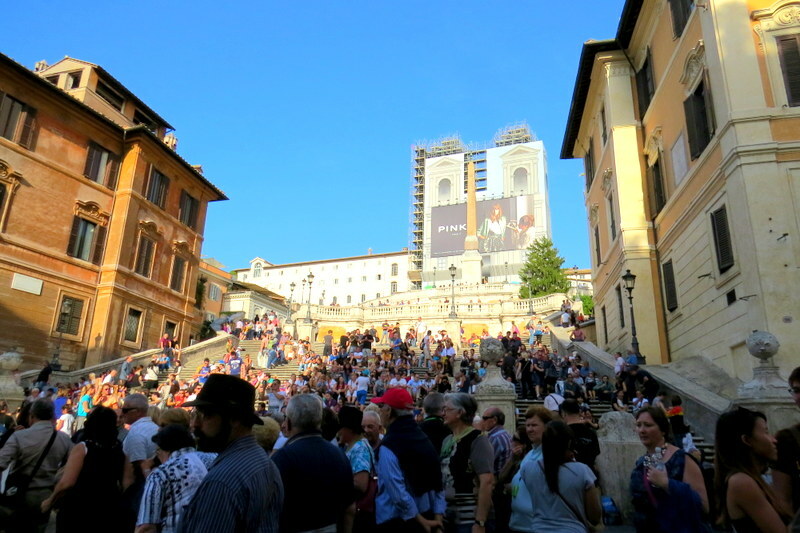 Read about other travel problems I’ve experienced here. What an adventure! I’m sure it was scary and frustrating as it happened but, the good news is, you have an awesome story to tell for years to come! Well you sure had more adventure than you bargained for Sara. Clearly it’s time for your SUV. On the brighter side you had more time to take in the crisp mountain air and beautiful surroundings. This place is DEFINATELY on my bucket list after your reading your wonderful post.